Are you bored with lifting weights? Are you sick of doing the same five or six exercises every day have you yawning rather than pushing yourself to build muscle? If so, it may be time to change it up – and the heavy rope workout may be just what you need! What Is the Heavy Rope? A heavy rope is exactly what it sounds like: rope that is heavy. It may sound silly, but working out with heavy ropes actually a very effective method of working your body in an unconventional way. So what does heavy rope training do? Heavy ropes are tied to an immovable object, such as a weight machine. The free ends of the ropes are held in your hands, and you fling the ropes around. The weight of the ropes will give you an excellent workout, and you’ll instantly feel your muscles burn. After all, the exercise you are doing involves motions that you’re not accustomed to, and all of a sudden you will find a brand new way of working out! What Do You Need for a Heavy Rope Workout Routine? Don’t get so hung up on the products sold in commercials and in magazines. You don’t need any fancy rope developed by sports goods retailers and sold for three or four times more than they should cost. Go to the nearest hardware store, ask for the thickest rope they have – usually between 1 ½ and 2 inches thick – and buy about 50 feet of the stuff. When you want to work out, loop it around a tree, pillar, or post, making sure that the two ends of the ropes are even in length. Hold one end in each hand, and you’re ready for the benefits of heavy rope workout! It’s cheap and easy! It’s new – It will not be the same old boring and stale weight-lifting routine, so it’s worth a try! It’s confusing – The workout will confuse your muscles, which means that they will strain them in a new way. Muscle confusion is one of the keys to speeding up muscle building. It’s fun – You can go crazy and have fun with the workout, and it will be something that you can tailor to your desires with each workout. Stand in a boxer’s stance, with one foot slightly forward and your hands at shoulder level. Twist your torso as you move your hands across your chest to one side, and twist again as you bring them across your chest to the other side. Repeat this motion, flipping the ropes with your arms and hands. Imagine yourself throwing an opponent to the floor with each turn, and you’ve got the exercise down. Repetitions: 20 to 30 times per side. The wave is the basic technique for the heavy rope workout, and it’s the easiest to master. 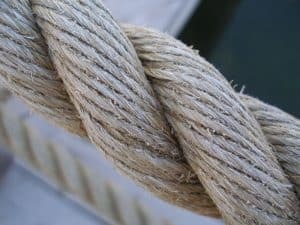 Simply hold your hands together with an end of the rope in each hand, and move them up and down to make waves in the rope. You can also move your hands in opposing directions to make alternating waves, which will work out your shoulders and upper body very nicely. Repetitions: 40 to 50 times per hand. Stand with your feet spread shoulder width apart, and put your hands together in front of you. Slowly swing your arms out wide, and whirl them up and around your body – tracing a huge circle in the air in front of you. Keep your hands together as you whirl the ropes around in a circle, and keep it up as long as you can. Hold the rope down by your waist, letting it lay slack on the floor. Quickly whip your hands up into the air, extending them high above your head before bringing them sharply downwards as if you were slamming them into the floor. Imagine cracking a whip with both hands, and you have the motion correct. You can alternate slamming one hand at a time, or you can slam them both together. Stand with your hands by your sides, the ends of the rope gripped tightly in each hand. Jump straight into the air, separate your feet to shoulder width, and bring your hands up to your head – all in one smooth motion. To complete the exercise, jump up again, place your feet together, and place your hands by your side. 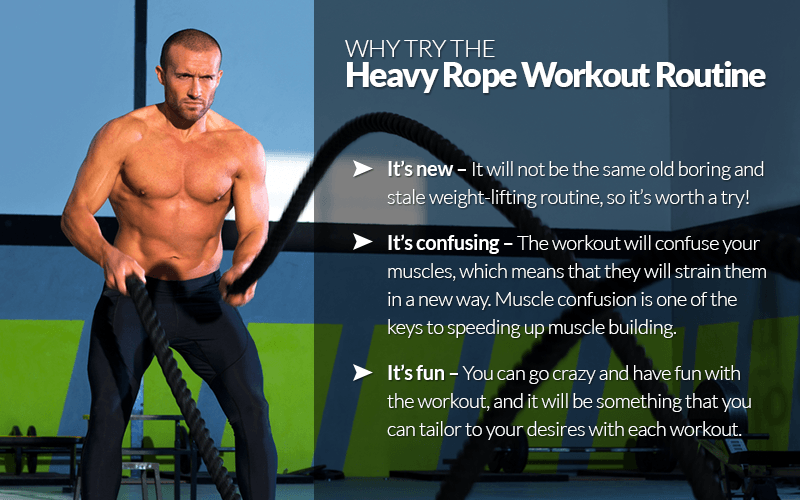 It’s worth trying the heavy rope workout, as it will be a fun, new way to push your muscles to their limits! What is The Best Forearm Exercise Equipment in 2019? How Much Cardio and How Much Is Too Much?